Bonjour! 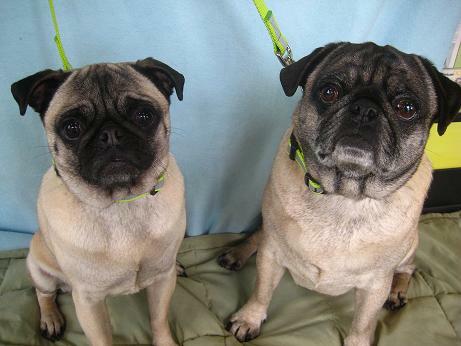 We are Bijou and Winston, 7 year old Pugs with double the love to share! We go together like two peas in a pod, or hot dogs on a bun, or, or Pugs in a blanket! We are bestest buddies and will liven up any home with our joyful presence. Work got you down? Drama with friends? The best remedy for all of your woes is just some cuddle time with us! We are bound to put a smile on you face, and we know you can put a smile on ours. So what do you say? Have some room for two silly Pugs? Well then fill out an application at pixieproject.org. We are fixed, vaccinated and microchipped. Our combined adoption fee is $300. We are currently living in foster care.